Winter preventative maintenance – Guttering. By 1wgtn|2018-10-04T17:05:14+00:00October 4th, 2018|Uncategorized|Comments Off on Winter preventative maintenance – Guttering. Damp spots on internal walls. Well Autumn is here with a vengeance. After the glorious summer we have all just enjoyed, we can all be forgiven for not thinking about the winter months ahead and the possible problems it brings with it. Roofs are the first port of call if you have unsightly damp issues. Those winds from Hurricane Albert or Andrew or whatever it was called were unforgiving. They may have dislodged a tile or three or a ridge tile may have been displaced leading to water ingress. But look a little lower down and you’ll find an equally likely place for those damp problems to manifest themselves. Your Gutters may look empty from the ground but they may be harbouring all kinds of hidden objects. Items such as moss, twigs, leaves, dead birds and dislodged render, they may even have there own little eco system going on with all kinds of weeds taking root. Also, if damaged by those winds, would need some works to fix any broken clips or unions that are dripping. Given these conditions, water will then have no other option than to go over the top of the gutter. Down your walls it will go and may cause some completely avoidable internal damp patches, especially on the older stone built properties you see around this area. The houses built in the late 1800’s and early 1900’s were built with stone mined in the local quarries. It was plentiful and cheap, but also has a terrible habit of absorbing water as its made up of sand, Sandstone ! Any cracks in your render, even hairline, will be the ingress point. Long term issues surrounding water ingress include blown render, damp patches on walls, wet timber joists, dry rot, when the timbers dry out. The pictured house was showing damp ingress in the eaves and on internal walls. On inspection it was discovered that the Guttering was leaking and that the render was cracked from the eave to the bottom of the 1st floor window. New guttering was installed along with a capping board over the existing fascia board. The crack was then ground out and filled with the proprietary external render filler, Touprelith F.
All that’s left to do is a lick of masonry paint which we’ll do later this week, weather permitting. 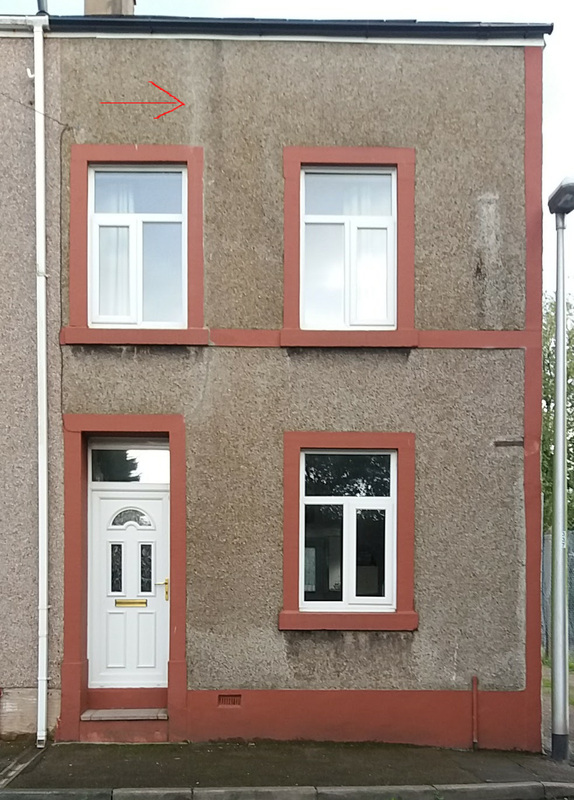 Offering wide coverage in the Whitehaven, Workington, Cockermouth and surrounding areas, with professional, fully insured and uniformed tradesmen, we can help with all aspects of property maintenance and repair. Call us now on 01946 758090 for more information on how we can help you protect your property portfolio. Spring Cleaning needn’t be a chore.